17 Agustus 2015 is the Indonesia's 70th years anniversary day. The fighting spirit to build the nation could be seen from all Indonesia's citizens. However, we should never forget to appreciate our heroes which had fight for Indonesia's Independence 70 years ago. "Great nation is a nation who appreciate their heros." Wise words by Mr. Soekarno, the first President of the Republic of Indonesia. It is undeniable that we have to continuously remember and appreciate our heroes. 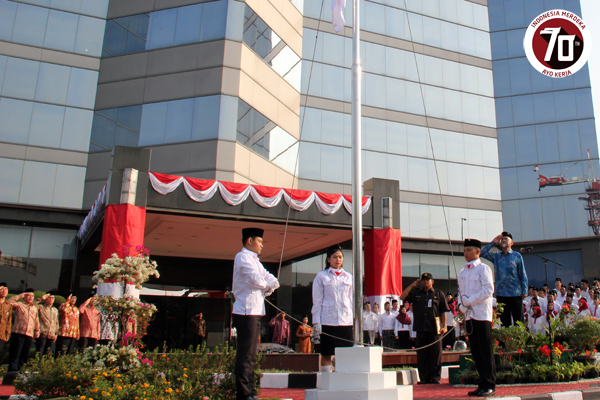 That's why on 17 Aug 2015 morning, PT Toyota Motor Manufacturing Indonesia (TMMIN) conducted Flag Ceremony to commemorating 70th Indonesia's Independence Day. The flag ceremony conducted at the front yard of the TMMIN Head Office building which located at Laksamana Yos Sudarso - Sunter. Led by Mr. Warih A.T as the TMMIN Vice President Director, the ceremony was held in a solemn atmosphere, especially when the Toyota Indonesia Youth Choir sung the National Athem: Indonesia Raya. After the ceremony, Toyota Indonesia held a warm gathering and conducted a 'tumpengan' ceremony as a form of gratitude and encouragement to face the future challenges.